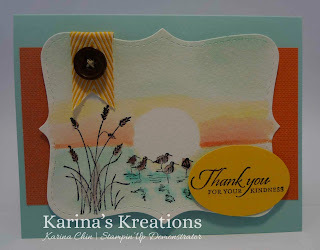 Karina's Kreations: Wetlands Stamp Set of the Month Card! Wetlands Stamp Set of the Month Card! Do you want to receive three card ideas in the mail every month? Sign up for my stamp set of the month Club. You can sign up for 8 months or just buy the current month. You'll receive three hand stamped cards plus the instructions. If you want to stamp your own cards, I even have a do it yourself option where you will receive all the card kits to stamp at home. Contact me at kchin2@telus.net if you're interested. The cost is $30.95 a month and includes a clear mount stamp set or equivalent product of your choice. This month one of the cards uses a watercoloring technique. Here's a video showing you how I colored the card. Nice job! I can't wait to get this stamp set. It is very versatile & there are so many card ideas out there using this set. I know you're going to love this set!! !